While checking stats of my other Blog, Chair Blog, I saw a referral from a Tumblr account. I didn’t know what Tumblr is about. I got curious and dug further into the phenomenon. Tumblr is a service to set up a Mini Blog. Its site doesn’t divulge much. It has a Blog, but that is updated scantily. For one reason or another I got curious plunged into it, started with an account and found out that it is really 1 2 3… and you have a mini blog up and running. It provides information about how to host it on your own hosting service. It has a couple of disadvantages: No archive that you can easily organize or navigate and no possibility to comment. I used it to put together my prior post, the week 8 review of Travel Blog Carnival submissions. Darren has organized the submissions via a special GMail account and asks the various reviewers to enter that account and make their choice. When I make my choice I like to scan each entry quickly’, make a first choice and then re read each entry in full. I found that 1 2 3 putting them into Happy Hotelier | Tumblr made it a lot easier to reread them, because the GMail set up is a bit cumbersome: You end up with your screen cluttered with all sort of posts. In this instance there were 17 posts, but some weeks there are many more. For those not into the reviewing process It may be handy to see what was choses from the submissions. A shared Wiki could be a solution, but might be time consuming again for the reviewers. So whenever I am researching a certain subject for Happy Hotelier it is usable to quickly dump Photos, Links, Quotes in several Tumblr entries and then go back to them to finalize a post here. I am a slow 2 finger typist and have far more ideas and pieces of information that I like to share with my readers than I can find time for to write, or cut and paste, neatly in a well organized entry here on Happy Hotelier. I believed I had solved this problem for the time being by using Google newsreader and by sharing items of interest via a widget here on the sidebar where the shares from this Google reader can be found as mere text links. In the meantime I also found out I gathered and shared already so much stuff between my shares, that clicking trough to Happy Hotelier’s Shared Items and reading it there is becoming a slow process as well and getting slower and slower, the more stuff I share. I wasn’t aware of it yet, but I can read my shared items faster in Google reader that as Happy Hotelier’s Shared Items, it offers a RSS feed for those who might interested in my shares. I believe any post on a Blog should go together with at least one photo or pictures as they say much more than words. In the Google reader widget you cannot add photos (at least you couldn’t when I installed it). Some time ago Jens Traenhart of Tourism Internet Marketing suggested to me to use a WidgetBox widget when you have two Blogs and want readers of one Blog being able to notice the other Blog. Recently I have made a widget for Happy Hotelier and also for Chair Blog. I found out that you can make a widget of a mini Tumblr Blog with photos. 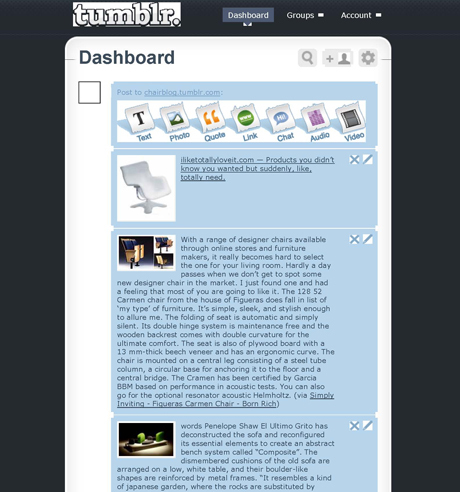 I hoped for a while I could replace the Google reader with shares and widget by a Tumblr account with widget entirely. Not true, because if you have 2 Tumblr accounts you have to log out and log in to change identity (No, I never installed the identity switcher, wouldn’t even now where to look to find it) between the two accounts. I need the Tumblr set up more for Chair Blog than for Happy Hotelier because I now know the Google with widget and RSS feed isn’t so bad after all, at least for the time being. The areas I cover here at Happy Hotelier are already wide enough. Chairs shouldn’t be added to that process. So I was looking for a separate sort of scrap book for my Chair Blog. Off course I could have created a separate Google Account for the other Blog, but that has has as mayor disadvantage that you have to switch identity at Google each time I would like to add an item for a possible Chair Blog entry. That switching slows down the process considerably. So I set up a second Tumblr account Chair Blog | Tumbler. Chair Blog is much more a mono subject Blog than Happy Hotelier. I only want to publish there about everything that has to do with chairs and chair design. Frequently there are chairs shown at fairs or exhibitions among other furniture or art. I want to pick them up. Chairs are auctioned among other items: I want to pick them up. The quick and easy way of Tumblr got me hooked. Over a very short period of time I was able to collect photos and links of over 250 chairs at . Before I dug into it I missed it, but Tumblr has its own Wiki Tumble Log If you read that and the posts they refer to you get a reasonable idea of what it is about. Gina Trapani at Lifhacker had a nice entry about it. If you look up Tumblr on Mashable you get some more background information. I for instance learned that only in November 2007 they came around with the present version 3 that works as it does now. Last, but not least this Read Write Web Interview with Tumbler founder David Carp gives some additional information. I’ve devoted a whole page at Chair Blog to the subject, in case you are interested. Next Next post: Cathay Pacific Ace Pilot Sacked after Youtube Publication of his Stunt.